Street Artists GAIA, KNOW HOPE, SWAMPY, CHRIS STAIN, FERAL CHILD among others to show work, Jordan Seiler to speak. An exhibition and conference focused on street art and its role in engaging public space. 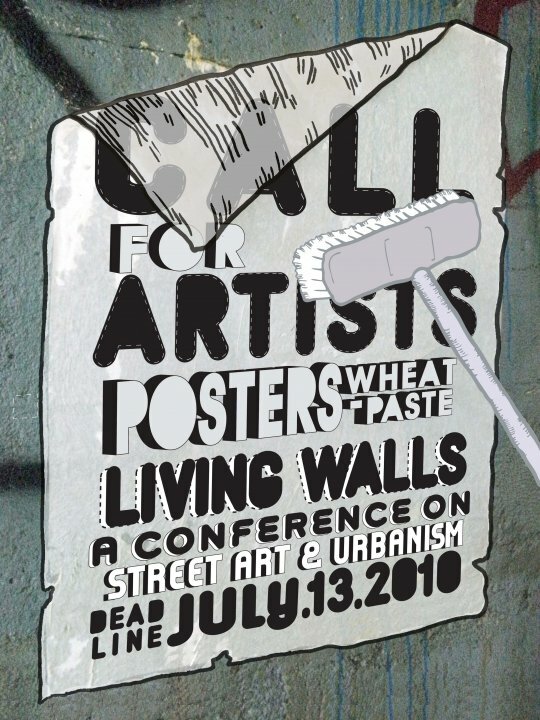 They are calling for street artists to submit posters with no constraint on quantity or size. From Street Artis GAIA on Vandalog: The artwork of 18 influential street artists from around the world will food the streets of Atlanta as part of a coordinated effort to engage the public via street art. Living Walls, The City Speaks, a conference set to take place on the weekend of August 13, 2010 at Atlanta’s Eyedrum Gallery, has put out an international call for artists to submit posters to three locations on three continents. These posters will ultimately be sent to Atlanta to be wheat-pasted on public walls and at Eyedrum. With many more artists expected to take part in this event worldwide, come August, Atlanta’s urban landscape will have a more vibrant, international feel. – READ MORE at VANDALOG.